Introduction EMSL Analytical provides testing services, sampling supplies and easy-to-use test kits to identify mold and other indoor environmental exposure hazards. The hurricane season of 2017 witnessed Hurricanes Harvey, Irma, Maria and Nate make landfall with the United States and its territories. All four of these storms left paths of destruction and widespread property damage due to strong winds, heavy rains, flooding and storm surge to the Gulf Coast, Florida, Puerto Rico and the U.S. Virgin Islands. Along the coast, the National Hurricane Center reports that storm surge is often the greatest threat to life and property from a hurricane. Storm surge is an abnormal rise of water generated by a storm, over and above the predicted astronomical tides. This rise in water level can cause extreme flooding in coastal areas particularly when storm surge coincides with normal high tide. Depending on circumstances, storm surge can span hundreds of miles of coastline and travel miles inland. Hurricanes Harvey, Irma, Maria and Nate were no exception, leaving behind billions of dollars in storm surge damage. In each of these storms, damage ranged from the complete destruction of property to other homes and buildings that can be repaired. To assist those impacted by storm surge, EMSL Analytical is committed to providing quick and affordable environmental testing services. Their network of laboratories provide all of the sampling supplies needed to test for mold, lead, asbestos, sewage and a wide range of chemical exposure hazards associated with cleanup and rebuilding efforts following storm damage. EMSL has even sponsored an educational video about storm surge, property damage and potential indoor environmental quality (IEQ) issues that can be seen at: https://youtu.be/AkSpWa-MuDQ. To learn more about IEQ testing of hurricane damaged properties or other indoor air quality, environmental, health and safety services, please visit www.EMSL.com, call (800) 220-3675 or email info@EMSL.com. For access to indoor environmental quality test kits, visit www.EMSLTestKits.com. 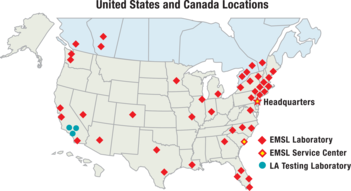 EMSL Analytical, Inc. is one of the leading testing laboratories with 40 locations throughout the United States and Canada. EMSL is a nationally recognized and locally focused provider specializing in fast laboratory results for mold, bacteria, Legionella, USP <797>, pathogens, asbestos, lead, soot, char & ash from fires, VOC’s, odors, radon, formaldehyde, indoor air quality, microbiology, environmental, industrial hygiene, radiological, food, beverage & consumer products and material testing services for the identification of unknown substances. EMSL services both professionals and the general public. EMSL maintains an extensive list of accreditations from leading organizations as well as state and federal regulating bodies including, but not limited to A2LA, AIHA-LAP, LLC (AIHA-LAP, LLC EMLAP, AIHA-LAP, LLC IHLAP, AIHA-LAP, LLC ELLAP), NVLAP, CDC ELITE, CPSC, CA ELAP, NY ELAP, TX DOH, NJDEP and multiple other state accrediting agencies. Please visit our website at www.EMSL.com for a complete listing of accreditations. In addition, EMSL carries a wide range of Sampling Equipment and Investigative Products for environmental professionals.